First on the list was a trip to the mall to see Santa. Shirley Temple once said: "I stopped believing in Santa Claus when my mother took me to see him in a department store, and he asked for my autograph." Well, that definitely didn't happen to Cam, but he was more than happy to sit on Santa's lap, especially when he had his buddy, Emma, to smile at! Christmas came a little early when Cam's nanny, Katherine, showed up one morning with gifts for the entire family! Cam had lots of fun opening his new Elmo books and movie. Jane and Chris were so surprised by the beautiful picture frame Katherine gave th em filled with awesome pics of their son. The frame was promptly hung up in Cam's room where he can see it every day. The holiday week continued with a visit from Grandma, Steffanie and Craig filled with a tasty lunch at Bagger Dave's and some last-minute wrapping. Friday evening included dinner at the Flegel's new home in Caledonia with a surprise Christmas gift for Cam- a new remo te controlled car! 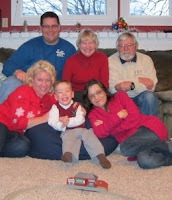 On Christmas Eve, the family attended church service at 4pm with their good friends and neighbors, the Raisch's. The remainder of the evening was spent with special neighbors we are so thankful to call close friends as well. Christmas Day was full of surprises for Cam- a new sled that was fun to sit on in the living room...until we have snow! A pop-up playtent, books, clothes, cd's, movies, and a small tr ain set. Jane surprised Chris & Cam with matching shirts that say "Weatherford's Garage" since the two of them have taken to completing ma ny projects together. This year we feel so blessed to have old and new friends, cousins, and relatives in our daily lives. Even though not all of our family members can be together for Christmas, we hold them all close in our hearts. Thanks for including us in the blog-it is always fun to see our names!